Food Blogga: What a Meatball! If you grew up in New England like I did, then you know that the word "meatball" has more than one meaning. It's more common usage refers to the food -- a small, round ball of meat that is cooked and served with tomato sauce. It's less common but more colorful usage refers to someone, usually a big, beefy guy -- also called a "chooch," -- who does something rude or bone-headed. In that situation, you'd say, "What a meatball." Get it? Good. Now you need to get yourself some ground veal from Strauss Free Raised Veal, a Wisconsin based company committed to raising calves more humanely, to make my Veal Meatballs with Fennel, Mushroom, and Shallot Tomato Sauce. Now, it's time for a meatball. 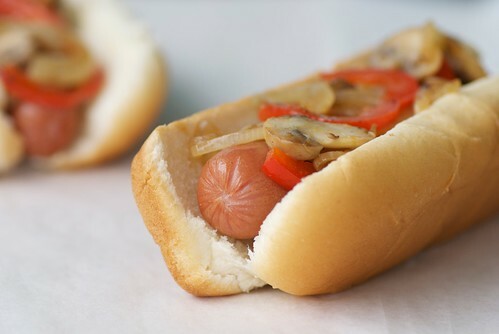 Italian Style Veal Hot Dogs with Onions, Peppers, and Mushrooms. 1. Pre-heat oven to 400 degrees F. Line a rimmed baking sheet with aluminum foil. 2. In a large bowl, combine all meatball ingredients. Using your hands, mix until the consistency is moist and the meat holds together well. If it's too dry, add a little bit of water, or another egg. If it's too moist, add some more bread crumbs. Using your hands, roll meat into 1 1/2-inch balls. It should yield 14-16 meatballs. 3. Place meatballs on prepared baking sheet. Bake for 20 minutes until golden brown. 4. Meanwhile, in a large skillet over medium heat, warm 2 tablespoons olive oil. Add shallots and saute 2 minutes until just wilted. Add fennel and saute 3-5 minutes until just softened. Add mushrooms and saute 5 minutes until lightly browned. Add white wine and let cook for 3 minutes. Add the tomatoes, red pepper flakes and salt. Bring to a boil, then simmer for 5-7 minutes. Add cooked meatballs to the sauce and cook over medium heat for 5-7 minutes until heated through. Turn off heat, and stir in basil. 5. Place torpedo rolls under the broiler until lightly toasted. Place 3-4 meatballs per roll, and top with a couple of spoonfuls of sauce. Garnish with grated cheese and a sprinkling of crushed red pepper flakes. Serve hot. Having known many "meatballs" in my years growing up in Fox Point, I would like to make the meatballs, the sauce sounds wonderful! Have never had anything made with ground veal. I would make shepperd's pie. I LOVE veal, and am so happy to see it raised this way! I'd love to try it! I'd like to try your meatball recipe. I generally use beef, pork and veal for my meatballs.Nice give-away! BTW - I grew up about 80 miles north of NYC and my dad (who comes from NYC) used the term "chooch" regularly, meatball as well! I am pretty sure I would make your meatball recipe with the veal! Looks great! I love veal but always feel kind of guilty about eating it. And now...I don't have to! These meatballs look great...I'll definitely be checking out this company! Despite the amount of food I have eaten in the past two days, that meatball sandwich is making my stomach growl! I don't think I've ever made a meatball in my life, so that's what I'd go for--a tribute to foodblogga! Sounds yummy, too. Merry Christmas, Susan! Hope you've been having holiday cheer with both types of meatballs! I love veal. I too love to make homemade meatballs with veal as one of my main meat ingredients. I've boycotted veal for so long it's hard to say what I'd make with it! I'm thinking perhaps a veal tourtiere as a nod to our neighbors to the North. We had my grandmother's meatballs last night! Not a veal-eater but impressed by your reference/source of veal. Thanks. That's easy. I'd make your meatballs! Fennel and mushroom tomato sauce sounds delicious! Thanks for the awesome give-away. Veal meatballs sound like a little piece of heaven right now :) :) Of course, I totally know a lot of human meatballs in my life too!! Definitely meatballs. No, wait... yes, meatballs. glad you like a WI product! 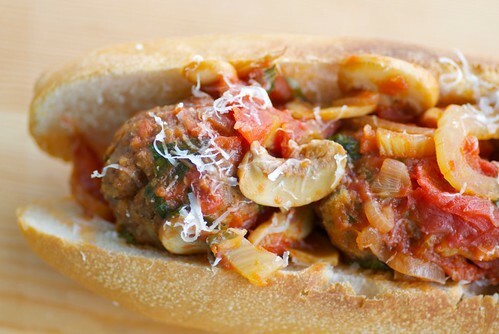 I would love to make the meatballs and put them with some pasta instead of a sandwich. I hope I win! mmm veal. I think I would make my usual bolognaise, but sub veal for the ground pork shoulder. Thats a great recipe. Thanks and happy holidays. Haven't had veal in years...would love to try this veal especially since the calves are raised this way. Couldn't bring myself to eat the other ones...thought maybe if no one bought it they would change their ways. Maybe it is working. I would make a meatball sub for my Papa! I would love to try your meatballs! I want to try your recipe for the wonderful meatballs! They look delicious and so satisfying. I do love meatballs (the ball of ground beef type, not the beefy guy type)! I wish that we had a good source of veal in these parts though! These meatballs look soooo good!! Veal is so good in meatballs! Oh MY, that looks good! And nice to see humanely, ethically raised veal - I love eating it but haven't done so for ages because of ethical concerns. Hope you had a fab Christmas and hope you have a splendin 2011! Thanks for sharing all these great recipes! I've started a new cooking blog myself and would any feedback or comments you can give, so please be sure to check out The Savvy Kitchen at www.savvykitchen.blogspot.com. I look forward to continuing reading your blog in 2011! Susan, this meatball would love some of the meatballs! Veal is so hard to find but I would much rather use it than beef. Your meatballs sound wonderful.